HOUSTON (KTRK) -- Anne Keller is a cosmetology student at Clear View High School. "When I was younger I was always messing with my hair," Keller said. She's learning all the skills needed to become a stylist and earn her license this spring. "People grow really close to their hair stylists," she said. And as she's taken on her first clients she's learned they will sometimes share many details of their lives. She recalls one client and said, "She started telling me how her husband abused her and she left and has a new husband, and she glazed over it and kept talking and it really caught me off guard." Victim's advocates know stylists can play an important role beyond that person's hair, by recognizing what also may be tearing at their heart. It's the first time the "Cut It Out" program has been taught at a school. 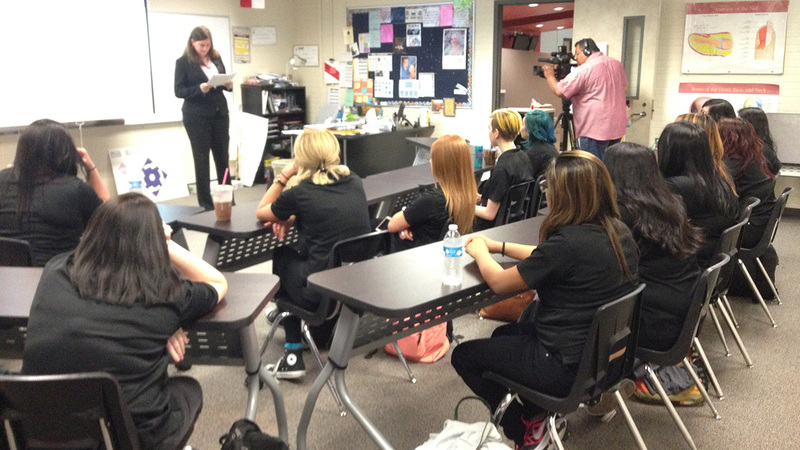 Future stylists are learning signs of family violence issues. Stephanie Jones is a victim's advocate with the League City Police Department and is teaching the program to the class. She says it's important for them to learn the questions to ask. For example, "Are you OK, can I help you with something?" and there are questions to avoid. Jones is a clinical social worker with the League City Police Department. She said, "The stylist has a unique opportunity to see what's hidden under makeup and hair, ability to see if there are marks and bruises, loss of hair." The student's cosmetology teacher has years of experience in the salon and says there were times she saw potential warning signs. "As stylists we have a reputation for listening and helping to solve other people's problems without having that psychologist degree. People do open up to us more than they would to say their neighbor," Teacher Kristi Foret said. Keller just placed at the state level competition and will be graduating soon to be a full time stylist. She wants her future clients to leave her chair feeling good about themselves from the inside out. Keller said, "It's surprising how much people will tell you. They don't even think about it, it just comes out."